Gold investing update: A new gold ETF, Merk Gold Trust ETV (NYSE Arca: OUNZ), was launched May 16, 2014. It seeks to corner an often-neglected part of the investment market: goldbugs who like to hold on to tangible gold. You see, Merk Funds, the firm behind OUNZ, hopes this new gold ETF will appeal to investors who wish for the opportunity to turn in their exchange-traded fund (ETF) shares for the delivery of actual physical gold bullion, like bars and coins. OUNZ isn't the first ETF to offer such an option. For instance, SPDR Gold Trust (NYSE Arca: GLD), the world's largest gold-backed ETF, also has a shares-for-gold exchange option. But Merk has found interesting ways to differentiate OUNZ from the crowd. Merk Gold Trust ETV is an exchange-traded fund with shares invested in gold bullion. The shares of this fund are designed to track the price of physical gold bullion, less the expenses needed for Merk Gold Trust to run operations. But that's not the main objective, according to Merk Investments President and Chief Investment Officer Axel Merk. "For OUNZ, tracking the price of gold is a secondary objective. Our first priority is to allow investors to invest in physical gold through an ETF with the option to take delivery. But that doesn't mean we don't take the secondary objective seriously," Merk wrote in an article he authored about his new gold ETF. "The most important differentiating factor of OUNZ compared to other products is that investors may request delivery of their gold," Merk reiterated in a phone interview with MarketWatch. 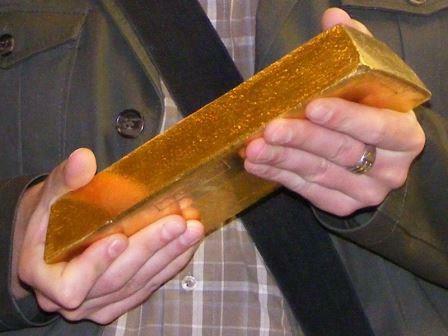 Here's how it actually works: Merk Gold Trust has possession of gold bullion in a vault in London. Investors can purchase pro-rata shares of this gold. When it comes time to exchange the OUNZ shares, investors have the option of receiving actual gold.